Can somebody please identify the location where this picture - from "The City We Loved" and reprinted on the Memories of Joan Powell page - was taken? Even though this is an image that I scanned myself from that "The City we loved" wartime publication, it has also intrigued me for a long time as to its location, as that booklet doesn't state where it was taken. With these sorts of puzzles I often try to find alternative books that might show the same picture but with more descriptive text, however, I have so many books now, that the task often seems to take forever! But.... tonight must be a lucky night, because I've just grabbed a pile of possible books, and the very first one I looked through has come up trumps! It's David McGrory's "Coventry at War", and he's used this image on page 58 including the line; "...carrying water past Judges Court in Little Park Street." At last! I must admit, before I found the book stating Little Park Street, my first instinct for the location was either Much Park Street or Spon Street! I had no hard evidence at all, but something about the scene just felt like one of those. However, looking at the Library Pictures pages, and staring at some of my maps, I've found nothing definite to say whether "Little" or "Much" Park Street is right. I have to say though, your evidence of the jettied timber building makes quite a convincing case for Much Park Street. Also, I can't quite make up my mind about the apparent "shadows" on the ground beneath the people. They might just be reflections off the wet ground, but if they are shadows, then the light will likely be coming from the south, making the buildings the west side of the street - in which case Much Park Street is much (!) liklier. If what we are looking at is indeed Much Park Street then according to this 1938 map at British History Online the industrial looking buildings which occupy most of the picture would be the Lea-Francis motor works. The works entrance to the factory is at the far end of the street just beyond the timber framed building. I think there's a photograph of both the works entrance and the timber framed building in Vol 2 of The Coventry We Lost but don't have a copy at hand at the moment to be able to check it. The zoomed-in version of this 1949 picture from English Heritage Pictures nails it for me. Much Park Street is top-left. The sign indicating the works entrance for Lea-Francis is painted on the wall of the building nearest the camera (no 7). Beyond it is the timber-framed building at nos 8-10 with the main Lea-Francis works beyond that. Under high magnification it can be seen how the timber-framed building juts out in front of the factory next door and also how the neighbouring buildings bend very slightly away from each exactly as they do in the top picture. Dutchman, you are good.... very good indeed! I don't know how on earth you found that photo, but I completely agree with your reasoning, and I think we can consider this particular puzzle well and truly nailed! Rob Orland said: .... tonight must be a lucky night, because I've just grabbed a pile of possible books, and the very first one I looked through has come up trumps! 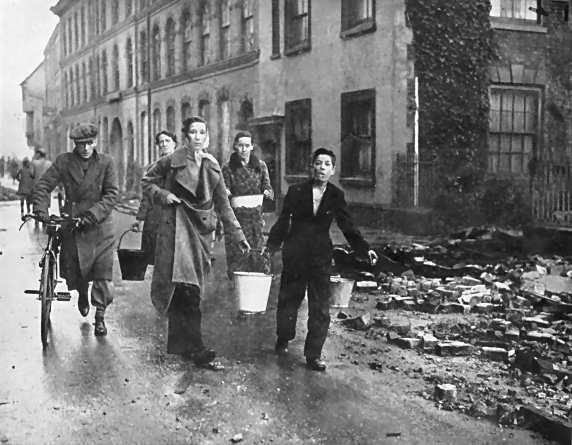 It's David McGrory's "Coventry at War", and he's used this image on page 58 including the line; "...carrying water past Judges Court in Little Park Street." Well, having stated on 6th March that I'd been 'lucky', I have to revise that thought! If, instead of picking up "Coventry at War" first, I'd looked at Dave McGrory's earlier 1994 book "Britain in old photographs - Coventry", I might have spotted page 121 where he correctly identified the above photograph as being Judges Court in Much Park Street. When he wrote the later "At War" book, his writing hand must have led him temporarily astray from his original findings! Well, "we all make mistakes", said the Dalek climbing off a dustbin! http://video.answers.com/the-london-blitz-and-the-bombing-of-coventry-in-1940-516911282 There is some good footage in this video. The morning after the blitz. Incredible piece of film, it really brings home to us all as to what they suffered during the blitz and for most, never to be forgotten. Thank you also. M'mm, I've seen this film before, as part of a much longer one, certainly the Coventry part. I think it was on TV or cinema at some point. At one point I remember seeing a film taken by German bomber crews of the bombing of Coventry, but I haven't seen it for many years. My mum, aged 84, is visiting me at the moment so I asked her if she had heard this story. She remembers that UXBs were taken to Whitley Common to be detonated and that on one occasion a bomb did kill the entire crew on the Common. In a separate memory, she says there was a policeman killed at the top of Bishop Street during a bombing raid. The Crane (or Cranes) pub was destroyed at the same time. The policeman was possibly named Fox. She thinks these events aren't connected but isn't 100% sure. "The Cranes" or "Three Cranes" survived the war although the building next to it was totally destroyed: There is (or was?) a personal account elsewhere on this site of a bomb disposal team being killed near the top of Bishop Street.